NBC Boston sports anchor Raul Martinez makes his pick for the Patriots season-opener, as well as his prediction for the 2017 season. There were big plays all over the field. The Chiefs, not the Patriots, were making them. Alex Smith threw two long touchdown passes and rookie Kareem Hunt, after fumbling on his first NFL carry, scored three times to help Kansas City stun New England 42-27 on Thursday night in the season opener. Hunt set an NFL record for a pro debut since the 1970 merger with 239 total yards. Coming off their sensational Super Bowl rally to a fifth Lombardi Trophy, the Patriots faded badly in the second half. A raucous sold-out crowd of 65,878 celebrated the unveiling of yet another championship banner, and there was plenty of talk about Tom Brady leading them to a 19-0 record. After Week 1, though, they are winless. 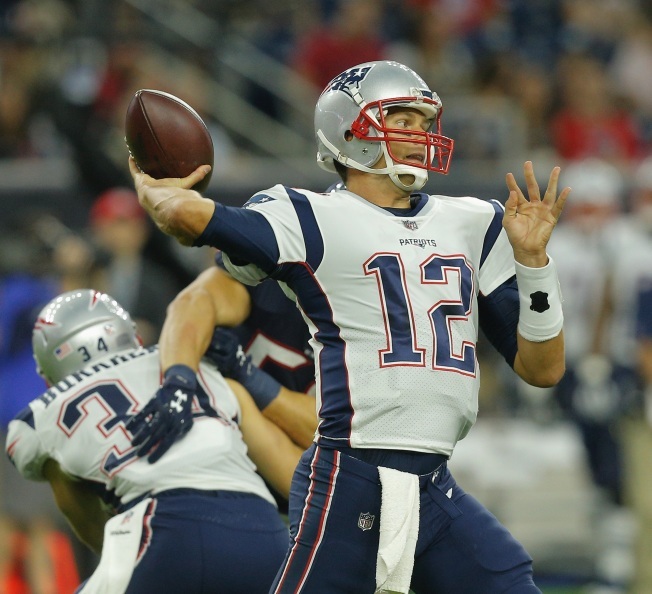 "Just a very poor effort and we'll have to do a lot better," Brady said. "Didn't make a lot of plays tonight." It was the first time the Patriots lost at Gillette Stadium when leading at halftime, a span of 82 games. The 42 points were the most they have allowed in coach Bill Belichick's 17-plus seasons. They were no match for the Chiefs in the last two periods. Tyreek Hill scored on a 75-yarder and Hunt put the Chiefs in front with a 78-yarder to punctuate Kansas City's charge after trailing 17-14 at halftime. Hunt also had a 58-yard scamper and finished with 141 yards rushing and 98 receiving. Hill had 133 yards through the air, and Smith went 28 for 35 for 368 yards and four touchdowns and no interceptions. He's the first quarterback with 300-plus yards, four TDs and no interceptions against Belichick. Brady, the 13th quarterback to start an NFL game at age 40, didn't look too spry. He struggled mightily in the second half and didn't throw for a touchdown, finishing 16 for 36 for 267 yards. Patriots newcomer Mike Gillislee scored on three short runs, becoming the first player since Terrell Owens of Philadelphia in 2004 to score three touchdowns in his debut with a new team. And Kansas City aided the Patriots' cause with 15 penalties for 139 yards. Yet, in the end, the Chiefs looked like world-beaters. At the beginning, it seemed like an extension of February's Super Bowl. Riled up, Brady and the Patriots tore through the opposing defense as if it belonged to, well, the Falcons, scoring in nine plays, with Gillislee surging in from the 2. One play later, they were at it again as Hunt fumbled. The Patriots took over at the Kansas City 32 and appeared to go up 14-0 on Rob Gronkowski's diving catch. Then a replay review overturned the score, with NFL headquarters — which now makes final decisions on such reviews — determining the ball hit the ground as Gronk came down in the end zone. Gillislee was stopped on fourth-and-inches at the KC 10 and the Chiefs, looking very much like the host team, marched 90 yards in 12 plays. Hunt made up for his early gaffe by gaining 25 yards on the tying drive, which Smith capped with a sharp 8-yard pass to Demetrius Harris. The teams traded long touchdown drives, New England going 82 yards to Gillislee's second TD, the Chiefs covering 92 yards at the end of the half before Hunt ran in with a 3-yard swing pass. Stephen Gostkowski's 25-yard field goal was the margin for New England's halftime edge. But the crowd's fervor was silenced with Hill's long touchdown on which prized free agent addition cornerback Stephon Gilmore was torched. Hunt sped down the middle behind linebacker Kyle Van Noy and DE/LB Cassius Marsh to put Kansas City in front for good. New England failed twice in the first quarter on short-yardage runs, by Gillislee and Super Bowl hero James White, and again in the fourth period, by Gillislee. If anyone proclaimed the Patriots were missing RB LeGarrette Blount, who scored 18 TDs last season and was a beast in such situations, well, Gillislee, who came from Buffalo as a restricted free agent, ran in for a pair of 2-yard touchdowns and a 1-yarder. Not only did the crowd revel in the video highlights from the Super Bowl, the fans booed vigorously when Commissioner Roger Goodell was shown talking on the sideline Chiefs owner Clark Hunt during warmups. A website distributed thousands of towels featuring Goodell's face adorned with a clown nose, and many fans also had T-shirts with the caricature. Goodell watched the game from a suite, but not with Patriots owner Robert Kraft. Kansas City's star safety Eric Berry was carted off with 4:56 remaining with an undisclosed injury. The Patriots lost perhaps their best defensive player, linebacker Dont'a Hightower, in the third quarter with a knee injury. His absence showed on Hunt's long TD reception. ... WR Danny Amendola left in the fourth quarter with a head injury. He's projected as New England's slot receiver with Julian Edelman out for the season. Chiefs: Host Philadelphia on Sept. 17. Patriots: Visit New Orleans on Sept. 17.